Hello all. I can definitely tell that school is out because I'm hanging with my kids so don't have a lot of time to post on my blog. I do have some really great things to post in the future so keep checking back. Today we are going to make a centerpiece for your Fourth of July barbeque. Even a beginner can make this arrangement. It is so easy to make and the end result is very impressive! You'll need a blue pot (Fred Meyer), a brick of Oasis floral foam (Hobby Lobby) and red and white flowers (Fred Meyer). Place your Oasis in a bowl of water until it sinks (it needs to absorb water to feed your blooms). Cut your Oasis to fit the pot. You may need to be a little creative. Add a chunk to the top to create a "dome". I used all of the Oasis for this arrangement. Cut your red flowers to about 1 1/2 to 2 inch stem. Insert the stem into the Oasis around the pot so it looks a little like this. Try not to let any foam show between the red flowers. Cut the white flowers to about 2 inches and insert them above the red flowers and on the foam dome. Make sure none of the green foam shows through. Ready for your holiday barbeque. Wouldn't it be cute to stick a flag or red, white and blue pinwheel in the top? Have fun and be creative. 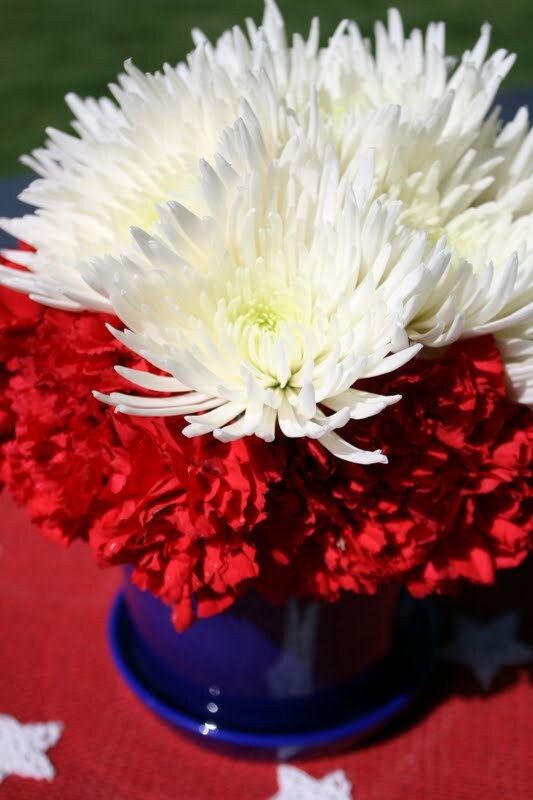 0 Response to "Fourth of July Centerpiece"